Imagine an urban environment where everyone lives within half an hour of beautiful beaches, hiking trails and a dozen enchanted holiday islands. 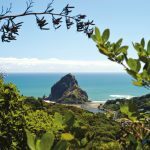 Add a sunny climate, a background rhythm of Polynesian culture and a passion for outstanding food and wine and you’re beginning to get a picture of Auckland and Northland. IN THE MAORI language, Auckland is known as Tamaki-Makau-Rau; ‘the maiden with a hundred suitors’. It earned this name because it was a region coveted by many tribes. 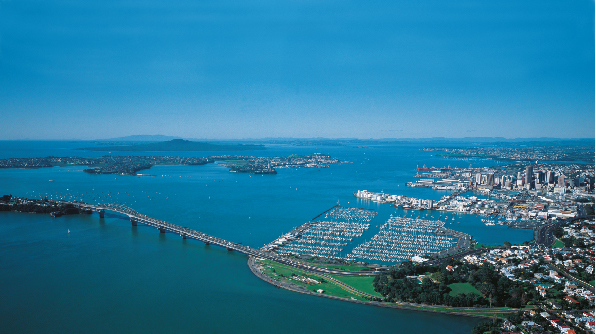 Auckland as a city is vibrant and the first major port and “big city civilisation” seen by crews after leaving the West Coast of the Americas and crossing the Pacific. 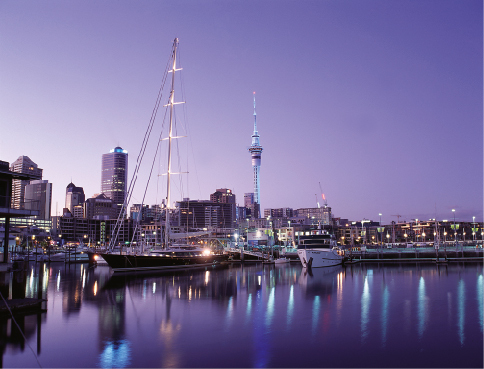 The city’s superyacht marina is situated in downtown Auckland, built for the 2000 Americas Cup and is surrounded by some of New Zealand’s leading bars, cafés and restaurants. All things marine are also found in this area from chandlery stores, spar manufacturers, leading engineering companies, haulage facilities and sailmakers and are all within walking distance from Viaduct Harbour. 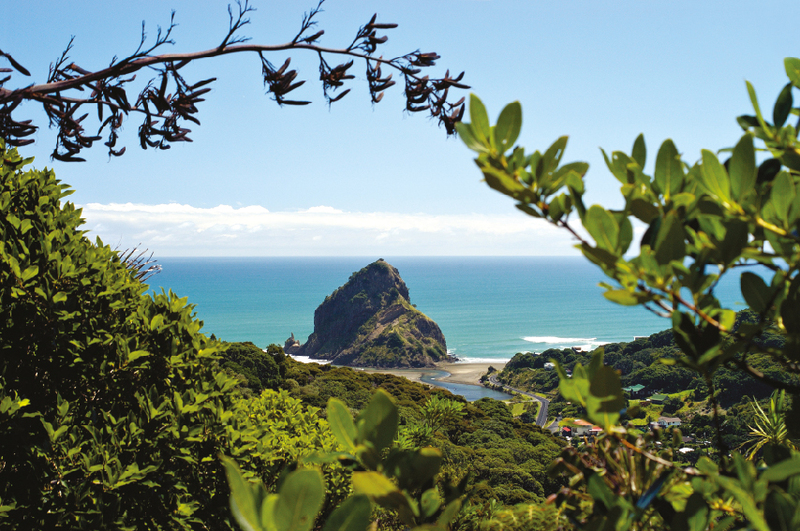 For a day’s trip, Team New Zealand’s yachts are available for match racing on the Waitemata Harbour, a visit to the scenic and very rugged west coast black sand beaches of Piha and Karekare, a surfer’s jackpot, or shop in the exclusive Parnell and Ponsonby districts only a five minute drive from the Viaduct Harbour. 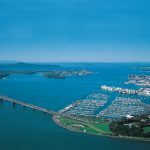 Within an hour’s sailing from the Viaduct are a multitude of sheltered bays and the islands of the Hauraki Gulf. One of the larger islands, Waiheke is just 14 kilometres from the heart of Auckland city. It’s a place that visitors, and the people who are lucky enough to live there, find particularly relaxing. Home to many of New Zealand’s successful artists, Waiheke has a long-standing arts and crafts focus. You’ll find a number of galleries and craft outlets in the seaside shopping areas. 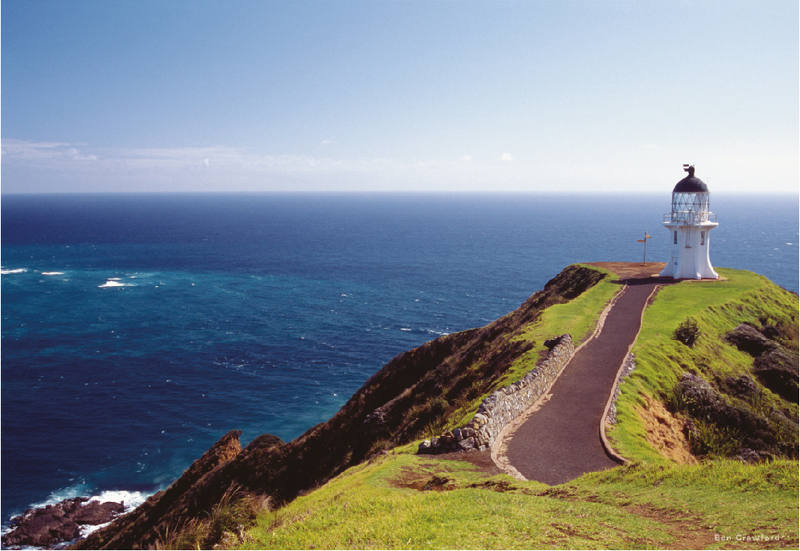 There are plenty of places to enjoy a good coffee or a taste of New Zealand’s clean, fresh cuisine. And with more than a dozen high quality vineyards, Waiheke is a wine lover’s delight. Many of the vineyards include relaxing cafe-style restaurants that look out across the vine-covered valleys to the blue sea beyond. Several well signposted walkways can help you work up an appetite or walk off an indulgence. The trails include cliff tops, beaches and native forest enclaves. Within a short distance from Waiheke are many fishing and diving areas including the reef off Motuihe, the islands of the Noisey’s, Rakino, Rangitoto, Kawau and of course the areas surrounding this. In fact you could quite easily spend a week poking around while using Waiheke as a base for guests not wanting to go fishing and diving. 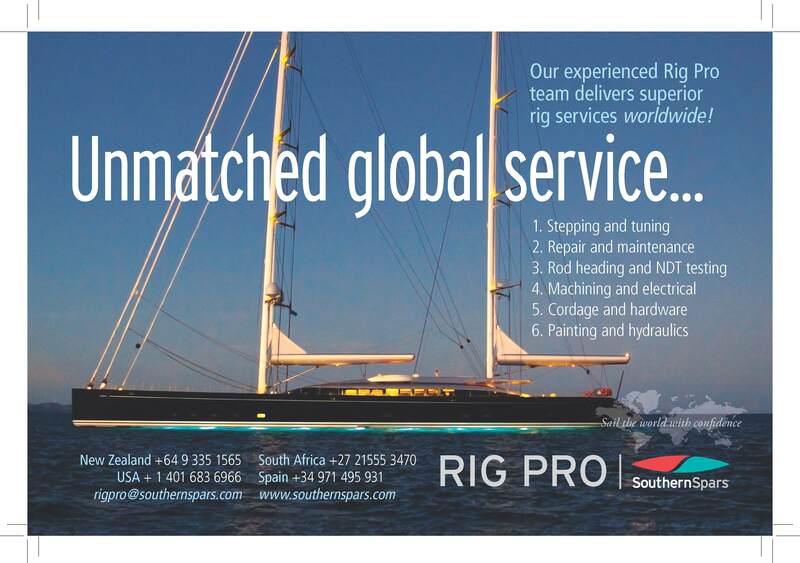 55 NM northeast of Waiheke Island lies Great Barrier Island. With a permanent population of around 700 this sparsely populated 285 square kilometre island is one of the few untouched and unspoilt places still remaining in the world. Over 60 per cent of the island is administered by the Department of Conservation and other reserves are managed by Auckland City Council so be sure to bring your walking boots because the island’s forests are laced with over 100km of tracks catering for every level of fitness. 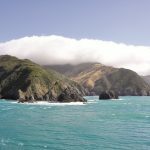 From a 30-minute gentle walk to the geothermal waters of the Kaitoke Hot Springs to a day tramp to the island’s highest point, Mount Hobson (621 metres) and the historic Kauri dams. The coastline also provides a diversity of habitats for aquatic plants and animals. The Barrier’s location on the edge of the Pacific Ocean means that its waters contain all manner of unexpected visitors from whales and pelagic fish to manta rays and turtles. Compared to city life, the Barrier has no street lighting and many homes are only accessible by bush tracks. There is no reticulated mains power, water supply or sewage system. Electricity is supplied by private generator or alternative power system. It is advisable to bring a torch. Cell phone coverage is limited to a few spots in Tryphena, Whangaparapara and Port Fitzroy. Other activities on the island include excellent fishing, surfing, diving, snorkeling, swimming, horse riding, mountain biking, harbour tours, and guided and self-drive tours of the island. 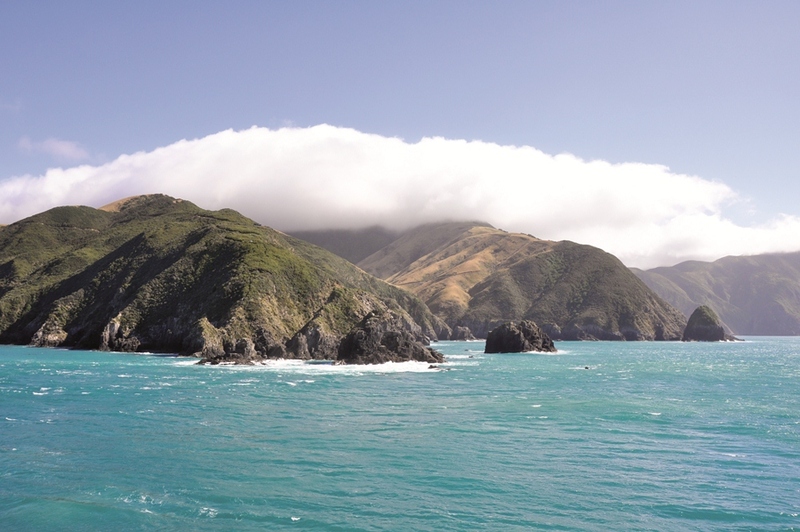 Great Barrier Island is the guardian of the gulf. As its name suggests, it shields the inner islands. Its eastern side takes a pounding from the Pacific, creating almost unmatched breaks on the surf beaches of Awana and Medlands. The western coast is more tranquil, with deep-water harbours that provide a safe anchorage for yachts. Great Barrier has the kind of rugged, untouched beauty that appeals to adventurers and that is getting harder and harder to find on our planet. Unsurprisingly, wildlife flourishes here – the island is a haven for rare birds and lizards. Around the coasts, it’s all about endless white sandy beaches and crystal clear waters that offer brilliant fishing and diving experiences. 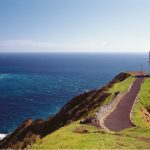 From the Barrier, you can either head south to the Great Mercury Islands, which give you access to the The Alderman Islands, Coromandel and Tauranga Harbour. 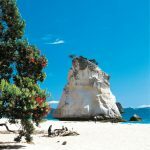 The Mercury Islands offer spectacular rock pinnacles, caves and drop-offs in 8-30-metre visibility, 15 NM out from Whitianga. Best sites are Black Rocks, Danger Rocks, Whale Rock and South Sunk Rock. The underwater terrain is exceptionally varied throughout the Islands. Never Fail Rock is a popular cave diving area with drop-offs to 37 metres. Scallops can be found at Opito Bay and Otama. While some 10 NM offshore are the Alderman Islands where scenic pinnacles and walls drop off to 55 metres and harbour abundant marine life. Big game fish are often seen along the drop-offs. Dogger Reef, 15 metres below the surface has a variety of pelagic species in summer and is often visited by sharks. Tairua Reef around 22 kilometres offshore has stands of black coral and myriad schools of fish in depths ranging from 9-46 metres. Overall the islands offer interesting diving, usually with fairly clear water. The Aldermans has some fantastic pinnacles and drop-offs. The diving is often compared to that of the Poor Knights but definitely lacks the amazing above and below arches and features despite being in the same volcanic chain of islands. Underwater the life is productive and there has been some unusual sightings over recent years such as Queensland Grouper, Oceanic White and Orca. 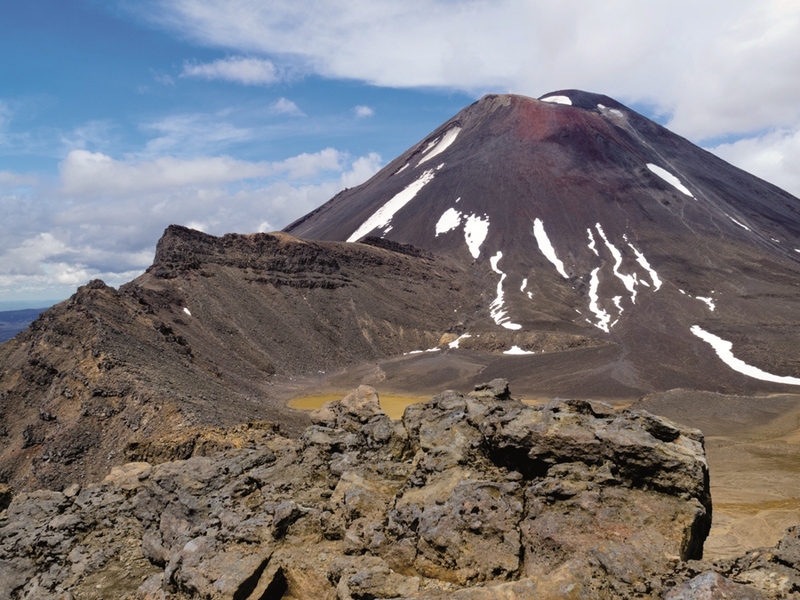 South to Tauranga offers access to New Zealand’s active marine volcano, White Island, via helicopter charter or fly inland to the Waitomo Caves and go caving. How often do you get to absail 400 metres into a cave and blackwater raft out? Definitely not for the faint hearted! 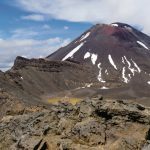 This area also gives you access to the inland areas and towns of Rotorua, the cultural capital of New Zealand and Taupo, New Zealand’s largest lake and trout fishing mecca. Lunch at New Zealand’s premier luxury retreat, Huka Lodge is spectacular. Depending on the season, Taupo can offer hunters Red and Sika deer, duck shooting, turkey shooting and wild boar hunting also. Travelling north from Great Barrier Island up the eastern coast of the North Island you can stop off at the Poor Knights Marine Reserve (approx 157 NM from Tauranga). The Poor Knights Islands were named by Jacques Cousteau as one of the top 10 dive sites in the world. Cousteau would know, and Cousteau was right! Separated from mainland New Zealand, the Poor Knights are influenced by a warm current that originates in the Coral Sea, north of Australia. Water temperature is higher, and visibility significantly greater than in nearby coastal waters. Tropical and subtropical life forms have become established among the diverse and multiple environments formed by the island’s volcanic origins. Underground caves, tunnels and archways are home to an extraordinary variety of seaweeds and dense populations of friendly, colourful fish. You can expect, the mixture of tropical and subtropical sea life and the clarity of the water result in an underwater environment that is unmatched. Nearby are another two great dives. Two former navy ships, purpose sunk for diving excitement, prepared and maintained for easy access penetration diving. When accompanied by a well-qualified wreck guide divemaster, this is high adventure diving. HMNZS Tui, formerly a US Navy ship, was designed for hydrological survey and submarine hunting spy work and protected New Zealand’s anti-nuclear protest fleet at Mururua. 62 metres long she now lies in 30 metres of water just 2km north of Tutukaka Heads. HMNZS Waikato, a Leander class frigate, complete with guns and helicopter hanger. 113 metres long she now lies in 28 metres of water just two kilometres south of Tutukaka Heads. Penetrate the wrecks through purpose cut access and exit point, and explore control rooms, bridges, crew living quarters and engine rooms via established routes. Another half-day north lie the Bay of Islands which has one of the best maritime parks in New Zealand with 144 islands and bays. 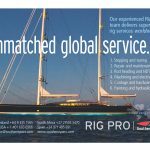 Marine life includes whales, penguins, dolphins and fantastic sports fishing. On the east coast of Northland, Russell, Opua, Paihia, Waitangi and Kerikeri all make up part of the Bay of Islands, a world-renowned tourist destination and the cultural centre of New Zealand. Waitangi is where New Zealand’s founding document, the Treaty of Waitangi, was signed in 1840. Some of New Zealand’s oldest buildings are found in the Bay of Islands. Desirable Kerikeri is one of New Zealand’s fastest growing towns and a horticultural hub with significant orchard plantings. From Kerikeri, flights and transfers can be made to West Coast for expeditions on quad bikes, BloKarts (micro land yachts), mountain bikes, On-Top Sea Kayaks and more in the backdrop of the world famous Ninety Mile Beach or the historical Ahipara Gumfields where once a huge town thrived. 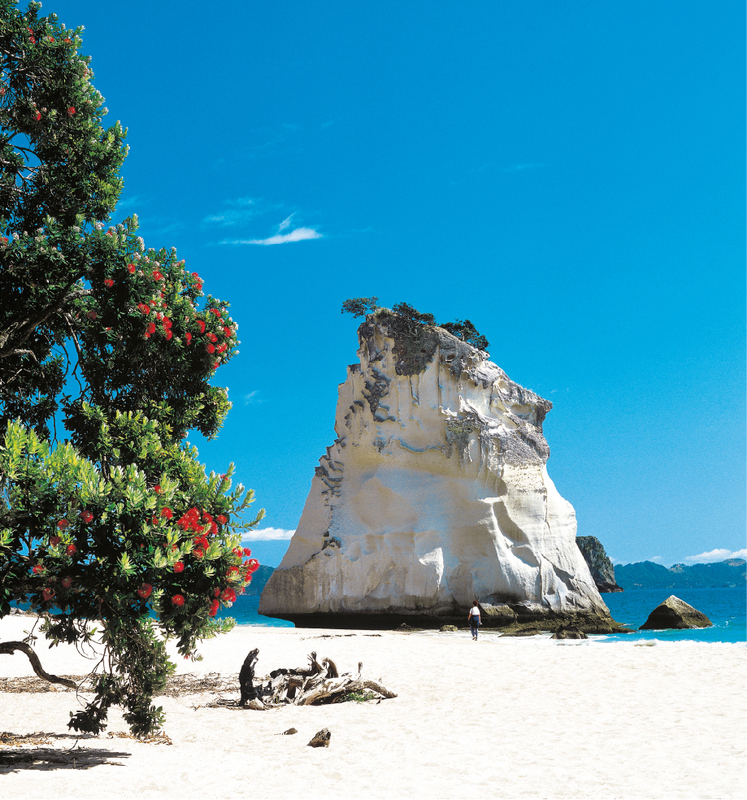 Enjoy a beach barbecue or Maori Hangi or enjoy a spiritual experience and visit to the greatest Kauri Tree of them all; Tane Mahuta. Learn from the guides the stories that abound about this giant. Just north of the Bay of Islands en route to Whangaroa Harbour lies another dive wreck. The Rainbow Warrior was Greenpeace’s flagship on its way to protest France’s nuclear testing on the Mururoa Atoll when it was sunk by French saboteurs on July 10, 1985, in Auckland Harbour. 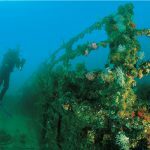 Three years after the bombing Greenpeace gifted the Warrior to the sea and she now lies as an artificial reef in the Cavalli Island group, a refuge for the marine life she was sunk trying to protect. At a maximum depth of 27 metres the Warrior is now home to a huge variety of aquatic life and is a world-renowned dive site. 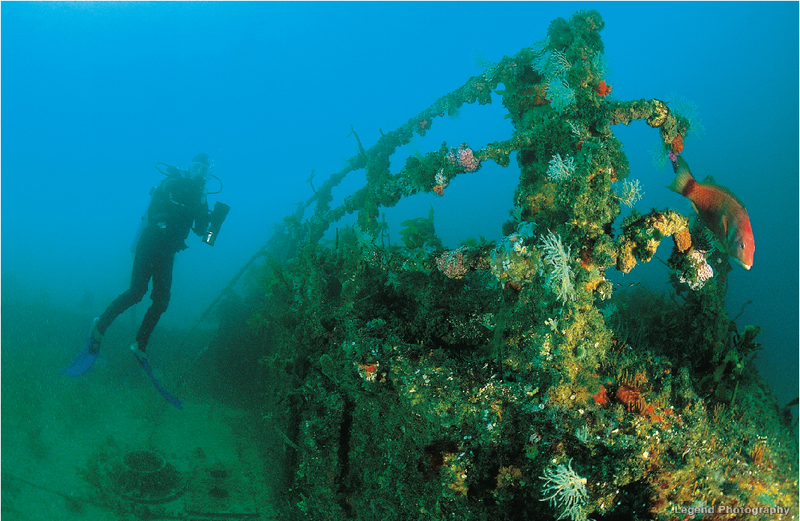 The Warrior is an amazing dive and truly is the ‘Jewel of the North’. This dive should only be attempted if you have experience diving on wrecks or are with an experienced diver. Nearby is the stunning Kauri Cliffs Lodge and Spa for the female guests or play a round at one of the world’s most spectacular golf courses situated at Kauri Cliffs. The final harbour north is Whangaroa Harbour situated in the far north of New Zealand on the protected east coast and has without doubt one of the most productive marlin fishing grounds in New Zealand. Whangaroa is world renown for its spectacular scenery, safe anchorage and for having the largest Striped Marlin in the world, known to many as the Striped Marlin capital of the world. When marlin fishing is just 15 minutes from the entrance to the protected harbour, pack attacks are not uncommon. During the peak part of the game fishing season, a significant number of the Bay of Islands charter boats base themselves from Whangaroa Harbour. This is a reflection of the productiveness of the Whangaroa fishing area and the suitability of Whangaroa as a launching point to the Three Kings and Middlesex Bank fishing areas. All of this within an overnight steam from downtown Auckland. Guests leave New Zealand saying if they’d known how much there was to see, they’d have stayed longer.